The easiest thing to do, which will have an immediate impact, is to lose the cabinets beneath the stove top and the sink. Leaving these two spaces entirely open allows for everyone in the house to cook and use the sink without frustration. 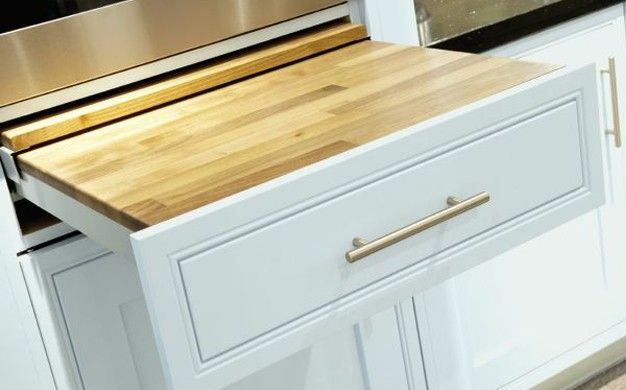 The next thing is to be sure that you rip out the kitchen island for most homes (they get in the way)! If you are doing a total remodel, remember to insure there are several 5 foot diameter circles free for turning around in and to make your entry doors larger to accommodate a wheelchair. Countertops tend to be a bit high for the comfort of persons in wheelchairs. Lowering the counter top by at least two inches a good idea. Go lower if no one in the house hold is extremely tall! Cabinets do not need to be high. If all low cabinets does not visually meet your requirements, then there are some very amazing ideas with lift systems, electronic and not, that lower shelves. There are several companies that make them or I&E Cabinets can custom make them for you. It's also a good idea to use a side by side fridge and put the microwave on the counter or lower. Ovens height needs special planning, too since it cannot be under the stove. 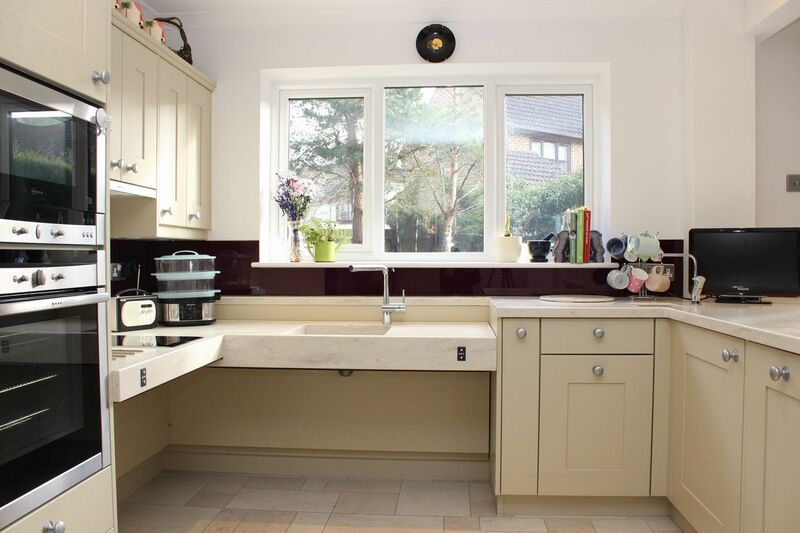 With the fridge, microwave, and oven, a pull out flat work surface near is ideal. Similarly think about dishwasher height and where you are keeping those dishes! A drawer with a plate organizer can be very easily built next to the raised dishwasher. Details often are the things we remember, it's the little things that day after day can either make us grind our teeth or smile as we lay down to sleep. One of the key details is having a water tap on the wall behind the cooktop, making it easy to fill a pot full of water. 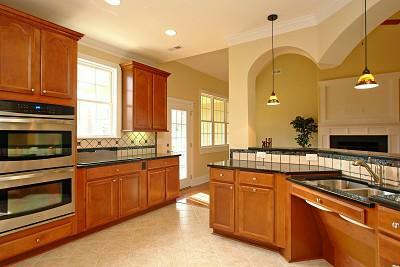 A kitchen that is open and low will still be frustrating if the cabinet space isn't usable. All cabinets need drawers, and pull out organizer bins. Ever consider an angled mirror above the stove to see inside pots easily? It's a great idea. Remember when designing your wheelchair accessible kitchen to keep all the controls (like the stove's! ), outlets and light switches close and in reach. Use the large flat panels for your light switches instead of the small toggles. Use lever handles instead of twisting knobs, too on the doors and cabinets. One of the great joys is having a beautiful, stylish home. Planning for wheel chair access in no way makes this impossible! Function in no way precludes fashion. Together with I&E we can build you what you need in a way that you love. Let's work together! You might want to include new dish washers in drawer form and suggest to manufacturers a completely different design for refrigerators and freezers (separate unites in drawer design). Also, arrange faucets on the side of sinks. Make stove tops only two burners deep because of limited reach. Try putting different size people of different sizes in wheelchairs and power chairs to test these ideas. These are all great in depth ideas!